'Olney Belle' (Richard Sparling, R. 1994). MDB, 6" (15 cm). Early midseason bloom. Standards white; falls white, blue spot; beards white. Parentage unknown. Miller's Manor 1995. From AIS Bulletin #297 April 1995 Introducing OLNEY BELLE (R. Sparling) MDB, 6", EM. 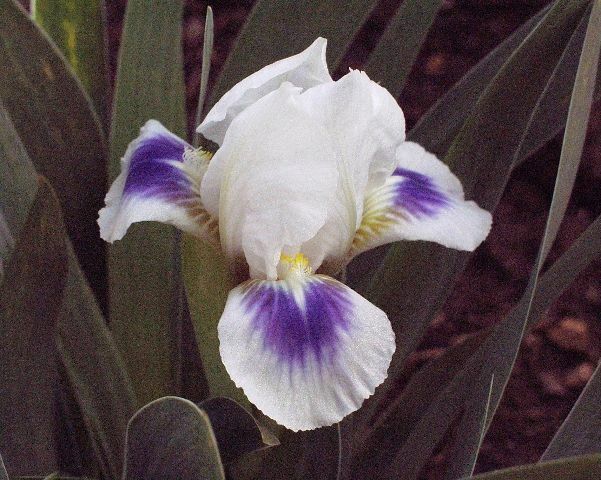 Showy snow white blossoms accented by large deep blue spots below white beards tipped yellow. Lovely round flaring form. Parentage unknown. $10.00. Miller's Manor Gardens.